I’ve been sharing out about our class work with merging video game design and story-telling, and my reminder to my sixth grade students about the importance of story. In a recent Gamer’s Journal reflection, I asked them to remind me of their game story-frame. 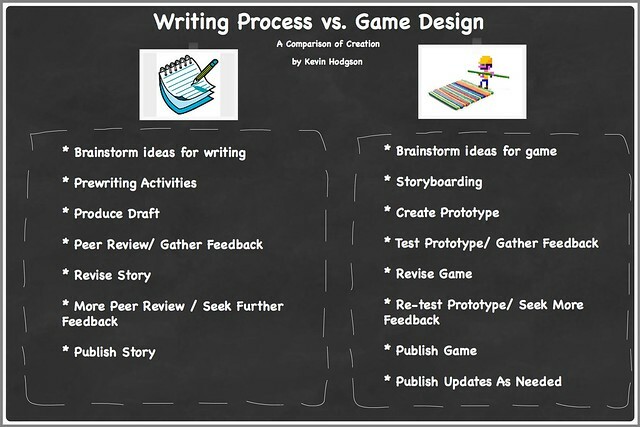 Here are some of the examples, which are a good indication of how my young writer/gamers are thinking of narrative in terms of game design. The story frame is that a young magician is trying to get revenge on another older magician that has gotten him in trouble and fired his favorite teacher for standing up for him. Your player is his servant and you must make the older magician look bad in return by stealing one of his magical devices, but that won’t be easy. The hardest part of building my game was making sure that it fit the story accurately. It is called “Lab X: the experiment”. It is about a scientist who is new at Lab X, and is told to see how an experiment ended up. He heads up to the room in which they conduct experiments, to discover that the experiment turned everyone else into monsters. Then he tries to escape with only the help of a few robots to instruct him. It is about a girl named Amy trying to find her long lost brother. He was taken from her and her family about a year ago. He was taken by evil creatures or the creatures of death. But in the second level you are her brother trying to escape from the creatures. The story-frame of my game is that Tyson (the character) is trying to save someone he knows Percy from Tartarus. There are 4 levels and Tyson starts at the Empire State Building and has to make it through the Empire State Building, the Underworld, and Tartarus alive. He will face monsters on his way, too. My story is about a young hero who wakes up in a wonderland after defeating Gregor the Great, (or so he thinks,) A great wizard that needs “sun-gems” for power. Roger G. will guide the hero through the wonderland so they can get the sun-gems to leave and thwart Gregor before it’s too late. My game is about sprites who are able to fly, and use their abilities on a daily basis. However, the new King has restricted their ability to fly. None of the sprites like this, and the player is chosen to go challenge the king to get back their right to fly. 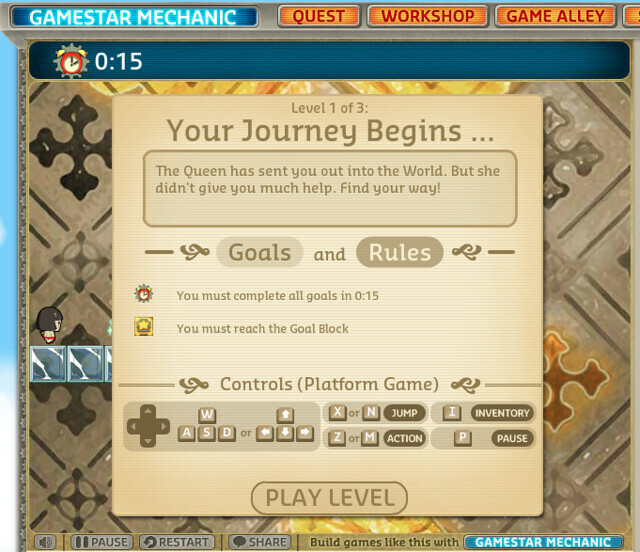 My video game follows the story of a heroine who finds the courage to go save the princess. The princess has been kidnapped (or I guess you could say princess-napped), by the Evil Oracle, who brings her to a secret chamber within a volcano. He puts her under a mind control, so she listens to everything he says. The heroine first escapes the kingdom, which is under a sort of lockdown. The next step is to venture through the Dark Forest, where she must battle three evil sprites to collect the Keys of the Forest, which allow you to safely leave. 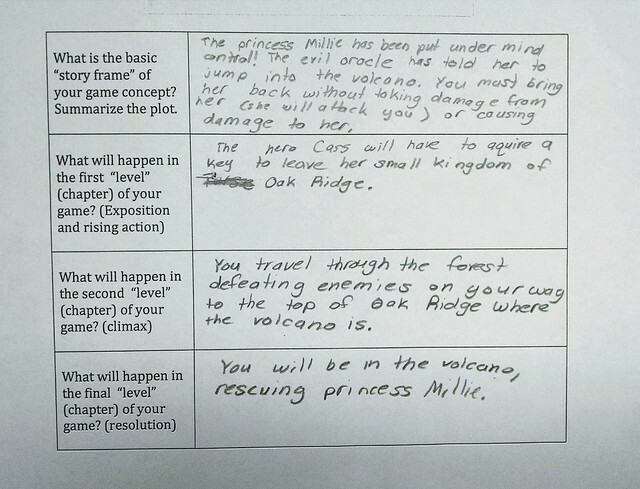 Lastly, the heroine must battle the Evil Oracle, who told the princess to jump into the volcano. She defeats him, and must rescue the princess, who will unknowingly attack you, without harming her. I would like to give you an update on my game I titled “The Treasure Rescue”. My game is about an evil turkey that steals the treasure that is filled with the national history of the Galapagos Island and the queen has asked you to go on a dangerous journey to find and retrieve the treasure. My video game’s storyline is you get captured by the evil snow Queen and you need to escape before she destroys your whole village with her giant snow monster servant! 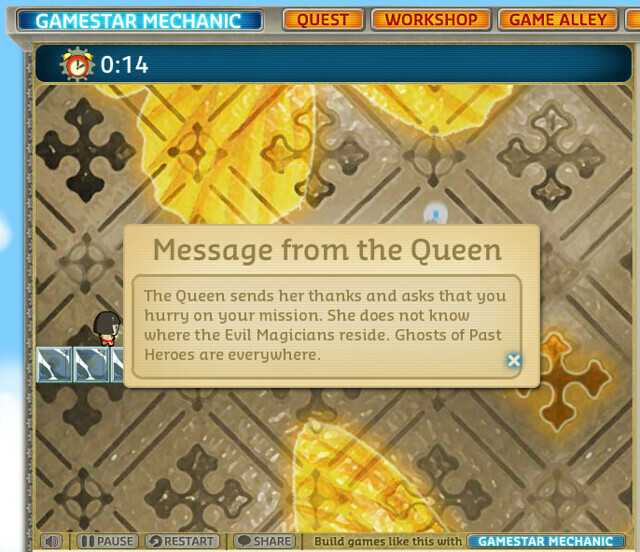 You have to escape her dungeon and get past her royal guards before it’s too late to save your village! 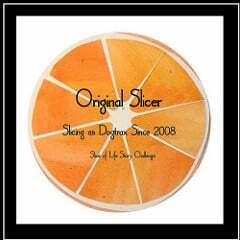 My students no doubt think I am a broken record (if they knew what a record was). Every day, as they are working on their Hero’s Journey Video Game Design Project, I am reminding them: What is your story? How will the player “read” the story by playing your game? Is each level a “chapter”? Where are you putting text into your game? It’s important that the narrative be part of the game, but they often get wrapped up in the design of the game that they are apt to forget about the story. My daily and constant reminders, and questions as they work, are more about narrative than level design at this point in time. As always, I am working on my own game as they work, too, as a way to share out my thinking process, my workarounds, my progress and a mentor text for them to play to understand the mix of game and story that this project is all about. You can play my game, in development process, if you want. I am revising my game as I work, re-publishing new versions as I add new levels/chapters, and talking through my process with my students. 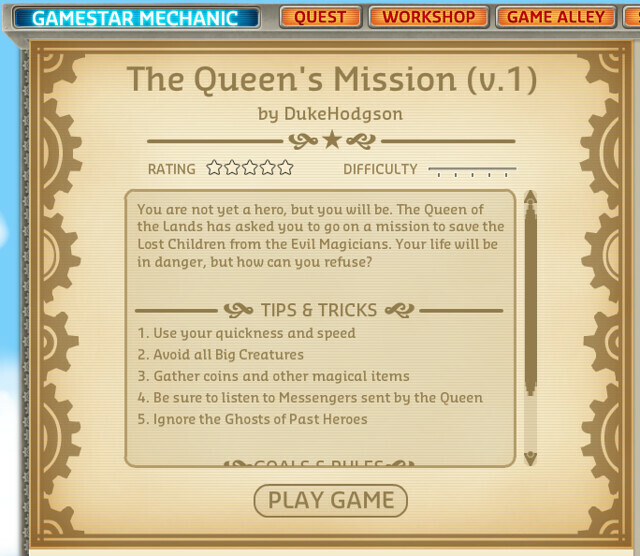 Play The Queen’s Mission (NOTE: does not work well on mobile devices). This is our fourth year (I think) of taking part in the Hour of Code, which nicely falls right within our video game design unit. I know that the whole Hour of Code gets some periodic push-back due to the corporate funding sources behind the week-long celebration of computer science, and that it gets flack from those who think the focused emphasis on programming and coding has gone too far. 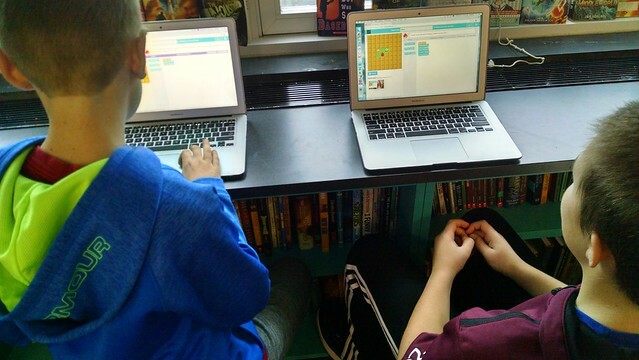 There are some pretty interesting projects available for young people to explore at the Hour of Code site, and during our time working on Hour of Code this week (as a break from our video game design project, another form of programming, right? ), many of my students — particularly the girls — were very engaged in the learning and the playing. So, there’s that. Which is a good thing. 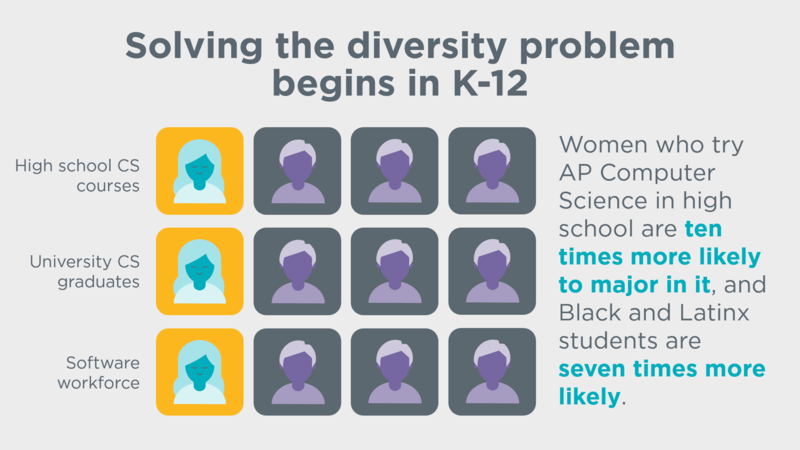 I had some students — but not many — who had done Hour of Code either in other grades (but not at our school, alas) or in technology summer camp programs. At least one had come to our Family Code Night held last Spring. 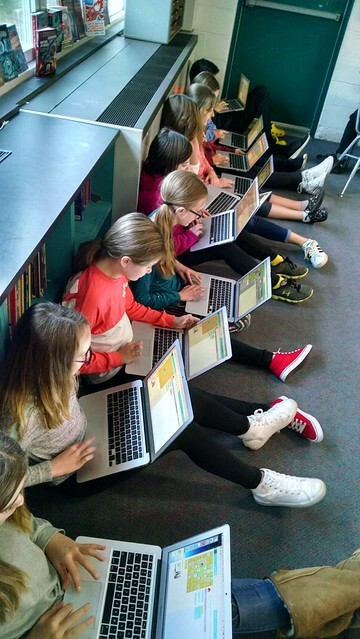 Those few with Hour of Code experience went into Scratch to work on some existing projects, sparking interest around them by other students. 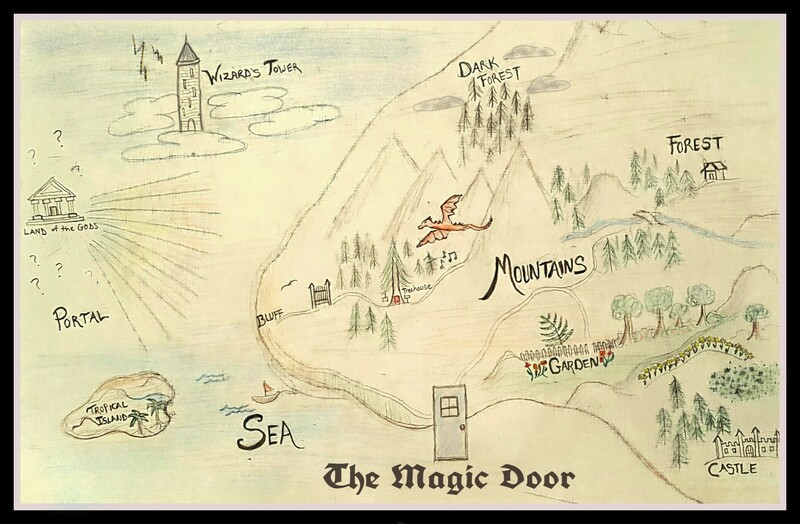 I wrote a bit about maps and writing in the classroom over at Middleweb, where I have a regular column about teaching. The piece dovetailed with work being done all November with CLMOOC on mapping in many forms and varieties. The latest in a series of Science Comics coming out of First Second Publishing will surely catch kids’ attention. It’s about dogs. 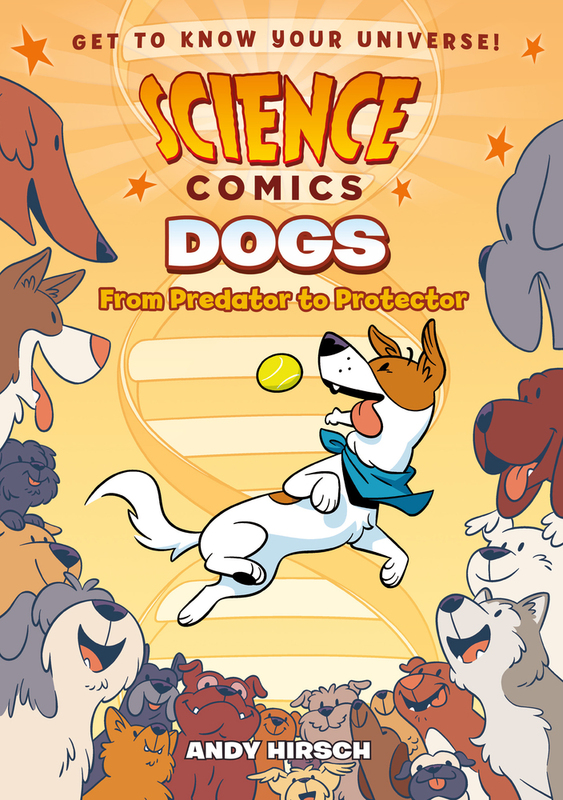 Artist/writer Andy Hirsch’s Dogs: From Predator to Protector is a lively romp through the canine world, told with humor and gusto and jam-packed with science. In fact, there is so much scientific information — told engagingly and with a nice mix of comic images and writing — that I wonder about the audience of this book. 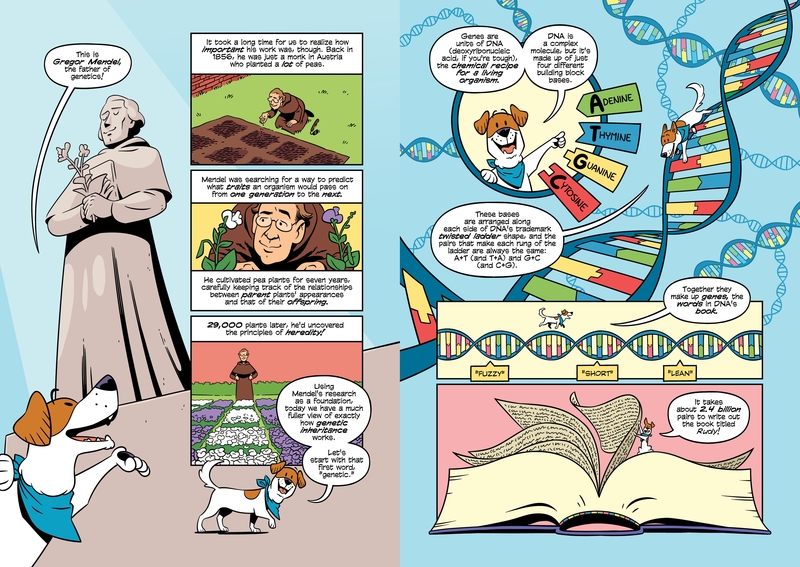 The text complexity pushes it into upper middle school/high school, I would think, as we learn about behavioral science, mapping of genetics, breeding for traits, the history of humans to animals (and vice versa), and more. It’s all very interesting, but deep and dense. Luckily, the mascot of the book — a dog off chasing his ball as a portal into time — is cute, and engaging, and very dog-like in his mannerisms. I suspect many kids will pick up the book because of its cover, and hopefully, they will stay to learn more about the complex canines in our midst. This book is another example of how the graphic story/comic format can engage learners and impart informational text, in a fun way. 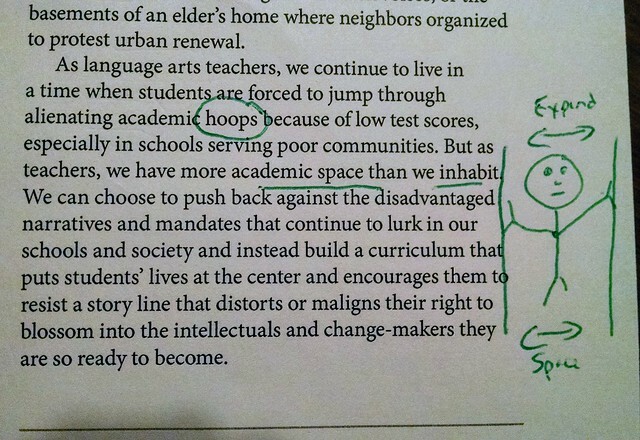 As part of the ongoing Writing Our Civic Futures project, through Educator Innovator and Marginal Syllabus, a crowd annotation of Linda Christensen’s deep article on how she turned her classroom around to focus on the lives of her students is underway. The project uses the open sourced Hypothesis tool, which allows for discussions and annotations in the margins of online documents. Linda Christensen is also participating, so you might have a chance to dance in the text with Linda. The article — Critical Literacies and Our Students’ Lives — was first published by NCTE via In the Middle, and Christensen’s views about how to pivot towards authentic stories in times of testing is an important sharing moment. I’ve been moving some of my annotations of the paper version of her piece to the online piece, via screenshots. But you can add text, images, gifs, videos, sound, and more in Hypothesis, creating a multimedia collage of thoughts and connections. I understood the gimmick behind this book but I could not resist it. 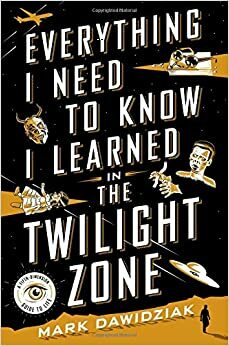 Mark Dawidzkiak’s Everything I Need to Know I Learned In The Twilight Zone is a fabulous read, with references to a myriad of stories that unfolded in Rod Serling’s Twilight Zone. 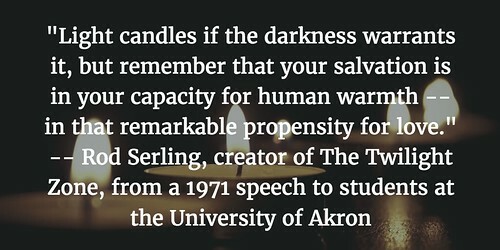 I won’t pretend I got all of the references to all of the episodes, but there were enough to jar my memory banks to the crafty stories of Serling’s show. Broken up into 50 lessons — from Always Keep Your Heart Open to the Magic that Comes Your Way to Don’t Live in the Past to Imagine a Better World to Angels Are All Around You and more — this book explores the strange terrain of the television show by reminding us of how stories can expose the truth of our lives. Reading the book had me digging out my old box set of DVDs of The Twilight Zone, to find reference points. It’s pretty amazing how Sterling’s production and his and many other writers’ stories still stand up over the decades. That is probably the result of the stories themselves, and the twists and themes that emerged on the small screen. Dawidzkiak is a media critic, whose beat has often been television. You can sense the love he has for Sterling’s art, and how these narratives can be grouped around important themes, or lessons that we best learn (or suffer the consequences, as often happens in the twisty ending of the show). Dawidzkiak remind us that Sterling sought to bring to the surface the good of people, yet was never afraid to punish those whose choices damaged the world, those around them, or themselves. Reading Everything I Need to Know I Learned In The Twilight Zone is sure to draw you back into the Zone. That’s not a bad place to be, as long as your heart is true. 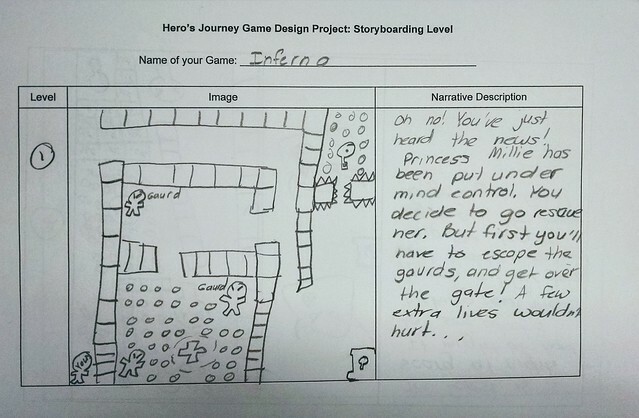 We’re just starting up our video game design project, with a theme of the Hero’s Journey as the storyframe for video games being designed and then published by my sixth graders. The other day, I gave them a few games from last year’s class (as well as my own mentor game) to play and to write about, from a player perspective. Right now, students are working on the brainstorming of the storyframe, and how they envision the levels of the game to look like via storyboarding. Yesterday, I shared out a few student sample BookSnap projects (inspired by Tara Martin), but I wanted to make a video collection as way to include all of the student work, for all of our students (and families) to see via our classroom blog. Animoto did the job.